Saint Elizabeth in the Bible Elizabeth is described as a relative of Mary, their relation is given by St. Hippolytus to whom they are cousins. The mother of Elizabeth called Sobe and the mother of Mary, Saint Anne were sisters . In the Gospel of Luke, Elizabeth is a descendant of Aaron the priest . 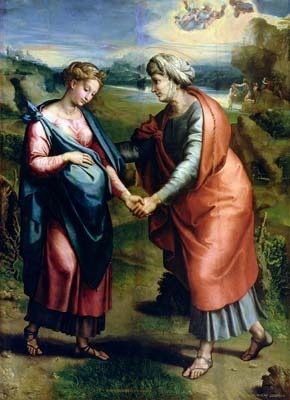 She and her husband Zechariah were righteous before God, living blamelessly, and childless. Zechariah was visited by the angel Gabriel, that told him his wife would have a son who "will be great in the sight of the Lord". Pregnant Elizabeth was visited by her relative, Mary, who was pregnant with Jesus And it came to pass, that when Elizabeth heard the salutation of Mary, the infant leaped in her womb.And Elizabeth was filled with the Holy Ghost and she cried out with a loud voice:"Blessed are thou amongst women and blessed is the fruit of thy womb." When Mary heard this she recited the Magnificat.